February 5th – I have absolutely no idea at all what’s happened here at all. It started at the weekend – a rubbing on the front disc brake on my current bike of choice. A light rub, no more that a tickle. As the days progressed it got worse, and defied my attempts to adjust it away. In exasperation, I removed the brake pads, which were OK at about 60% remaining. The leaf spring that keeps them off the disc however, was broken. This was allowing on pad to rub. An easy, 30 second replacement. But I’ve never had a spring fail like that that hasn’t been worn on the disc as the pad ran down. This is most peculiar. I shall keep my eye on things in case it’s something significant. 25th November – A mechanical job that should have been easy was far from it. Replacing brake discs resulted in a struggle with seized fasteners, the failure of a brake calliper and the discovery that the parts I thought I had in the spares box brand new for this eventually were in fact the wrong ones. The front disc was so badly worn it was starting to warp. Perhaps I shouldn’t leave it so long next time. December 13th – The snow, ice and road grit is destroying the brakes on two bikes at the moment. This rear disc is now wearing considerably, and is about 0.3mm thinner than it was new, and the front, 0.7mm. That doesn’t sound much, but once you get to about 1mm worn off, the discs get so thin they buckle and become useless. One thing about cycling through the winter: It isn’t cheap! November 27th – Been a while since I discussed brakes here, but the glazing issue of the rear pads I had – I think I’ve cracked it. And built Frankenbrake as a result. I, like many utility and commuter cyclists, like to ride a bike that’s essentially a tourer. I like the bars, the variety of positions, and I like that Shimano finally made hydraulic brakes for road and cyclocross bikes with the same bars. The trouble with tourers for years has been that they’re mongrels. No one groupset (ie. drivetrain with brakes and controls) is wholly suitable. Tourers carry load, don’t mind a heavier bike as it’s sturdy and stable. They like a wide gear range – preferably a triple front ring. And solid wheels with damn good brakes. So a good tourer may have utlegra, SLX, XT and 105 series parts all working together. Brake options have traditionally been anything you want as long as it’s canti, but since road discs and suitable frames appeared – first cable, then hydraulic – our braking options have improved. My rear brake – A Shimano R785 lever with a BR785 calliper – has been eating pads. They appear to glaze, loose all friction, and no matter how well cleaned, filed or surface ground, never regain bite. Pads are not cheap. I thought I’d cracked it using Uberbike pads – but the last two sets have gone really quickly. The last set went a week after fitting, and without the same happening on the front, I decided to solve the issue. I’ve been using a primitive parking brake on trains – I use a rubber loop to keep the back brake on to stop the bike rolling about. 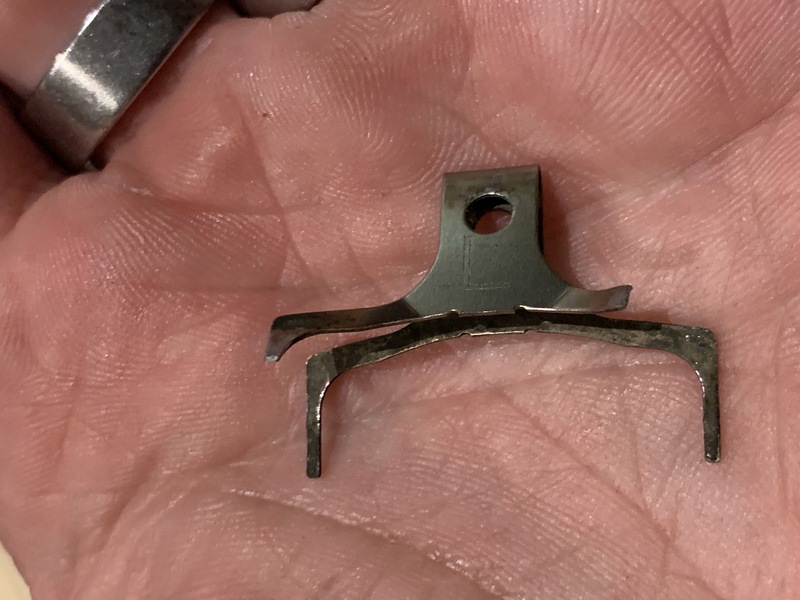 It turns out that the brakes aren’t designed for continual operation like that, and the vibration from rocking was weeping fluid out of the piston seals, on to the back of the pad plate, and dropping the odd drip of fluid onto the rotors. I’ll stop using the band. But that left me with a possibly faulty rear calliper, which has never been quite as snappy as I’d like. And Shimano are transferring to flat mount – a format incompatible with my frame – for their 785 replacements. I knew the 785 was a variant of the XT mountain bike, 2 piston brake with slight design changes in shape. Reading about, I found people who’d put Shimano 4 piston callipers on XT levers for mountain bike use, so I figured a 4 piston Saint calliper should therefore work with a 785 road lever, as the same oil volume was being moved as the XT model, if you see what I mean. They all use the same hoses and fluid, a light mineral oil. So I ordered a saint calliper, got the bleed kit out, and got oily. The result is that the Saint calliper works really well, has a much bigger pad friction area, and is nice and firm, yet progressive. It’s a bit more fiddly to set up as the piston stroke isn’t as large, but it’s working well with patience. To any home mechanic who’s thinking about this, it’s an excellent upgrade – but as with any brake fluid operation, remove pads and keep well away from the disc as you will spill oil everywhere. Meanwhile, a slow handclap for Halfords. When on the off chance I called in for a bottle of Shimano mineral oil brake fluid, the twit behind the counter said ‘Use Dot 4 – it’s all the same stuff.’ – it so isn’t. Dot 4 is Glycol, not oil, and will swell and perish Shimano seals and cause premature failure. Urrrghh. January 25th – It perhaps hasn’t become apparent yet to most folk, but to cyclists and those bound to the outdoors, this has been quite a grim winter. We’ve had far more frosts this year than last, and consequently, there’s been a lot more salt on the roads. The damp but not terribly rainy conditions have led to a corrosive, goopy, sticky road grime that coats the bike and is taking a steady toll, particularly on the wheels and brakes. Investigating a rub tonight, I noticed the corrosion on the disc pads, and the badly grooved disc. Aluminium parts are developing a familiar white bloom. There is surface rust on the exposed bare steel surfaces of pedals and bottom bracket. When the weather clears, all this will need attending to. September 20th – Spotted in a customer’s cycle shed, two bikes side by side that illustrate something that annoys me. Shimano, the Japanese industrial giant that revolutionised cycling are not what many people imagine them to be. They are essentially production engineering experts, probably more than they are bicycle technology or fishing equipment manufacturers. Shimano make loads and loads of great, well thought out products that I love. their work to refine the derailleur gear system in the 80s and 90s, their clipless pedal systems and electronic gear technology have changed cycling for the better immensely. But something more than these innovations has had a massive influence. Shimano sell innovative kit to bike manufacturers. That means they also sell and produce the tooling to manufacture bikes en masse. Shimano often market products to manufacturers because they’re cheaper or easier to assemble on a production line, but sometimes of little discernible end-user benefit. Shimano pioneered the external bottom bracket, a frankly piss-poor idea that is hated by lots of cyclists for it’s increased wear and susceptibility to corrosion. Shimano invented it to make assembly of bikes from one side far easier. It shifted to producers in large numbers and is now, sadly, ubiquitous. Similarly, for years, bicycle disk brakes – which I love as a technology – had their rotors attached to the wheel hubs by six M5 screws, like the bike in the top picture. This ‘6 bolt’ design has been a standard for more than a decade, and works well. You can feel if there’s a securing issue without the loose disc being dangerous, and the rotors are light and easy to replace with standard workshop tools – usually an Allen or Torx driver. Shimano recognised that a big cost in disc brake adoption to mainstream bikes was assembly of the disc onto the wheel – six screws require either a complex, mutispindle head or an operator repeating the same action 12 times per product. So they invented Centerlock(sic). The lower picture shows a bike with a Centerlock rotor. Centerlock uses a splined male dog on the hub, and a special brake disc with a mating female recess. The rotor slides onto the splines, and is held in place by the same type, thread and tooled ring that holds the gear cassette on a rear wheel, thus requiring one tool to fit the cassette and two brake rotors, a huge cost saving in production. Centerlock rotors are heavier, and you need a special tool to fit or remove them. If the ring comes loose, there’s nothing else to hold it.They limit consumer choice of aftermarket replacements. There’s a whole industry sprung up around centre lock to 6 bolt adaptors. This change in technology was introduced purely for the benefit of bike manufactures, arguably to the detriment of consumers and to me, is inferior. August 1st – A mechanical mystery. Three month old Shimano hydraulic brake pads, which suddenly lost grip and appeared to be glazed or contaminated. The pads are the sintered metal type and are genuine manufacturer parts. Sometimes, long periods of braking can ‘glaze’ pads. causing them to become highly polished and shiny, meaning they don’t work well. The common treatment for this is to file the surface of the pad and pop them back in. These I have degreased, cleaned, filed and even surface ground, but whatever I do they quickly glaze again. New pads of the same type were just fine. March 11th – A nasty graunching from the rear brake on the way home was severe enough to have me check it out as soon as I got home. Much to my shock, I found the stock, soft resin-organic brake pads in my rear calliper were just a bit worn. The new sintered metal ones are at the rear, the ones I took out in front. That’s bad. Should have spotted it sooner – luckily I don’t seem to have damaged the disc. Never take your eyes of those essential maintenance tasks, people! January 28th – I’ve not mentioned much about the bike technology on this blog, which is a bit odd, really, because without it, I wouldn’t be able to ride like I do. One of my favourite innovations of the last ten years or so is the road disc brake. This model – the Avid BB7 – is designed to work with road, rather than mountain bike setups and levers. It is cable operated and stops you on a sixpence, wet or dry. There’s no rim wear, no rubbing, and the pads last for ages. Maybe not quite as good as a top-end set of hydraulic discs, but not far off in my opinion. All my bikes have disc brakes, fantastic things.